NEC DSX 40 Three Phone Package. 4 incoming Lines x 8 Digital Stations x 2 Analog Station Ports Configuration Phone System out of the box. 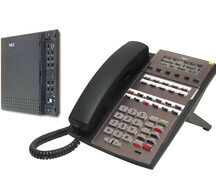 3-22 Button Display Speakerphones with Intercom.